Some countries have achieved considerable success in solid waste management. But the rest of the world is grappling to deal with its wastes. In these places, improper management of solid waste continues to impact public health of entire communities and cities; pollute local water, air and land resources; contribute to climate change and ocean plastic pollution; hinder climate change adaptation; and accelerate depletion of forests and mines. Compared to solid waste management, we can consider that the world has achieved significant success in providing other basic necessities like food, drinking water, energy and economic opportunities. Managing solid wastes properly can help improve the above services further. Composting organic waste can help nurture crops and result in a better agricultural yield. Reducing landfilling and building sanitary landfills will reduce ground and surface water pollution which can help provide cleaner drinking water. Energy recovery from non-recyclable wastes can satiate significant portion of a city’s energy requirement. Solid waste management until now has only been a social responsibility of the corporate world or one of the services to be provided by the municipality and a non-priority for national governments. However, in Mumbai, the improperly managed wastes generate 22,000 tons of toxic pollutants like particulate matter, carbon monoxide, nitrous and sulfur oxides in addition to 10,000 grams of carcinogenic dioxins and furans every year. These numbers are only for the city of Mumbai. This is the case in cities all across the developing world. There are numerous examples where groundwater is polluted by heavy metals and organic contaminants due to solid waste landfills. Solid waste management expenditure of above $ 1 billion per year competes with education, poverty, security and other sustainable initiatives in New York City. Fossil fuels for above 500,000 truck trips covering hundreds of miles are required to transport NYC’s waste to landfills outside the city and state. 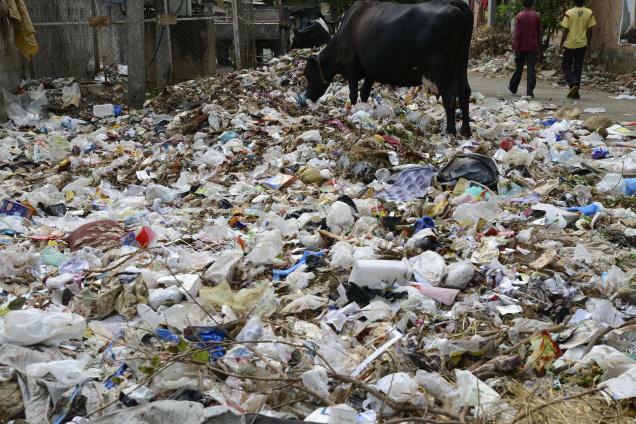 Similarly, New Delhi spends more than half of its entire municipal budget on solid waste management, while it is desperate for investments and maintenance of roads, buildings, and other infrastructure. Solid waste management is not just a corporate social responsibility or a non-priority service anymore. Improper waste management is a public health and environmental crisis, economic loss, operational inefficiency and political and public awareness failure. Integrated solid waste management can be a nation building exercise for healthier and wealthier communities. Therefore, it needs global attention to arrive at solutions which span across such a wide range of issues.